Beech is a resilient and distinctive timber, with an attractive grain pattern and hard-wearing properties. This 900mm beech floating shelf incorporates all these qualities, and comes pre-drilled for your convenience. Specialist shelf fixings are also supplied, which are hidden once the shelving is installed, creating the impressive floating effect. Each individual beech shelf has been carefully made by our skilled team of wood experts, using the latest innovations in wood cutting technology. Once cut to size, the beech shelves are sanded to a super smooth finish and coated in protective oil to enrich and nourish the wood grain. This floating solid oak shelf measures 900mm X 200mm X 40mm and sports an attractive square edge profile. Constructed from the same finger-jointed, high-pressure glued staves as our solid beech worktops, our shelves are immensely sturdy. 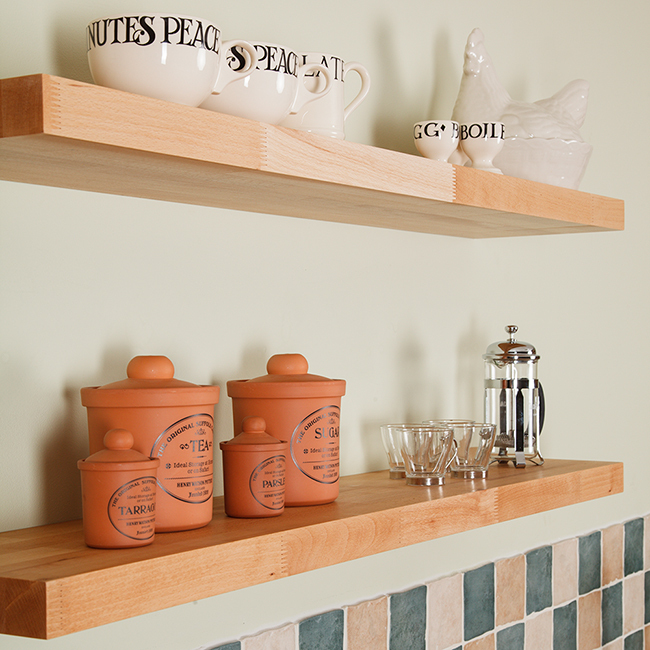 Our 900mm floating shelves are provided with three floating shelf supports. These should be fixed to a sturdy brick or concrete wall; if you have stud partition walls, we recommend attaching the supports to the timber studs to ensure the shelves have adequate support. Made entirely from real wood, beech floating shelves occasionally feature natural developments such as small knots and splits. These do not affect the reliance of the timber, and only serve to enhance its natural and unique character.